If I were stranded on an island and given only one skincare product, it would be Vitamin A. If I had a nickel for every time I've told a client that, I'd have a million dollars. Ok, maybe a couple hundred, but you get my point. Vitamin A is hands-down, one of the best ingredients to add to your skincare arsenal. It is an absolute must. In todays article, I'd like to teach you about the different forms of Vitamin A, why its so beneficial, and how to use it to promote healthy, happy skin. Retinoids are chemical compounds derived from Vitamin A. Both retinol and Retin-A are retinoids. Vitamin A, a fat soluble vitamin, is naturally present as retinyl esters and beta-carotene. Retinoids come in prescription form and over-the-counter. Some products can only be obtained by visiting a physician, while others are sold exclusively to skincare salons, and the remainder can be found at drug and beauty stores. Retinoic Acid (Tretinoin) is a prescription retinoid and is the active ingredient in Retin-A. Prescription retinoids are formulated as retinoic acid - the only biologically active form of retinoid that directly affects the skin. Retinoic Acid begins working immediately, and patients using products like Retin-A see results in as little as 4-6 weeks. The problem with retinoic acid (tretinoin) is the aggressive nature in which it works. Many people experience excessive peeling, prolonged redness and burning. This often leads to discontinued use, or a desire for a lighter, but effective version. Retinol is a mild form of retinoid that must be converted into retinoic acid by the body. The process of conversion weakens the strength and thus, allows the product to be used more frequently, without the side effects of Retin-A. When retinol is applied topically to the skin, it interacts with naturally occurring enzymes to convert retinol into retinoic acid (active form). HPR is a revolutionary new form of Vitamin A - an ester of retinoic acid. HPR is bioavailable in its current state, but comes without irritation (like Retin-A) or metabolic steps (like retinol). Think: results like tretinoin, daily process like retinol. 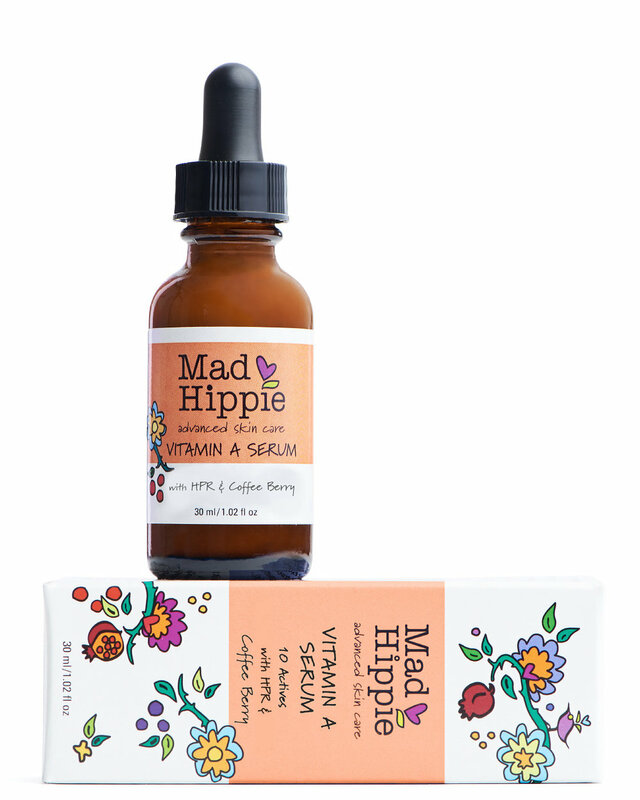 Madhippie is one of the companies utilizing this form of Vitamin A. One of the many reasons I chose to carry this line in my salon. In our attempts to understand the way the body works, we categorize. We forget the body does no such thing. The body functions as one synergistic unit, and must be approached as such. Those who feel they need a formula as aggressive as Retin-A, must remember this. Lifestyle factors such as diet, sleep, and stress are undeniably the route cause of such severe conditions. Retinol is both safe and effective and I highly recommend it. There are no magicians here. If acne is your problem, you must start the correction by healing internally. There are two categories of aging: intrinsic (chronological) and extrinsic (photoaging). Extrinsic aging results from cumulative ultraviolet (UV) exposure, pollution, and lifestyle factors such as diet, exercise, sleeping positions, smoking, and daily skincare habits. It is estimated to contribute 80% to the overall visible signs of aging. Intrinsic aging is genetically determined and controlled by one's overall health and epigenetic factors that express inherited aging traits. This photo demonstrates intrinsic vs extrinsic aging. In 2012 the New England Journal of Medicine published this photo. This 65 year old man had been a delivery truck driver for 28 years. You can see the advanced aging on the left side of his face from UV exposure versus the right side of his face, which was better protected. Vitamin A has the ability to target both intrinsic and extrinsic aging, a major wow factor. Now, when I say Vitamin A, what I am really referring to is retinoic acid. Any topical form of Vitamin A will come as or be converted to retinoic acid - the form used by the skin. Retinoic Acid regulates the expression of different genes. It's like a therapist, effectively communicating with your cells, telling them to conduct themselves in a youthful manner. Retinoic Acid can bind to virtually any skin cell receptor and control its behavior. When Retinoic Acid does this, a cascade of events happen. An increase in epidermal cellular reproduction is initiated, the outermost layer of the skin becomes compact with new cells, new collagen and elastin fibers are produced, supporting glycosaminoglycans are deposited (such as hyaluronic acid), and new blood vessels are formed in the papillary dermis. Why is vitamin a good for you? That paragraph above says it all, but let's break it up a bit. Retinoids are the only FDA-approved product on the market that actually reverse the signs of aging and diminish current wrinkles. Vitamin A (retinol) is used to treat skin conditions such as acne, psoriasis, aging, discoloration, and congested skin. It has supreme restorative properties and anti aging benefits. These 13 benefits are the reason I won't shut up about Vitamin A. If you aren't already using a retinol, I'll assume you've added one to your cart, or that you've abandoned this article to drive frantically to the store to purchase one. If you have done the latter, pump the brakes babe! Remember, retinoids can repair current signs of aging and skin damage. If you are a first-time retinoid user, your process will start with what many doctors call "retinization". If using a prescription retinoid, this will consist of 4-6 weeks of raw, flaky, redness that even the best concealer can't hide. If you have chosen an OTC counter option (my pref) the initial reaction will be minimal. Retinoids are trainers. Meaning, they take time to train and shape up the skin. As I stated earlier, when retinoids bind to the cells, they begin to instruct, much like a symphony orchestrator. The first order of business will be to discard any current accumulation of dead skin cells. In this process of "normalizing", where the uppermost layer of cells begin to flatten and behave properly, water retention may reduce - temporarily. This can result in some dry or flaky skin, but that doesn't mean it should. Retinoids promote natural cellular turnover. Meaning, when your skin renews itself naturally, you don't notice or see this happening - the same should fall true with retinol. One of the great things about the Madhippie Vitamin A, are the additional ingredients that promote moisture retention. If you find your skin has become excessively dry or flaky, back off the frequency or reduce the strength of your product. With any product, you should ease into daily use. Start with every other night and gradually increase to every night. Those with sensitive skin should start with every third night, then increase frequency. A little goes a long way, so be conservative. Start with a half dropper of your Madhippie Vitamin A and add more as needed. Tip: Don't forget the neck and the chest! These areas, along with the face and arms, are the most exposed to the sun and need all the love they can get. Forgetting this is how women look different ages on their face and on their neck when they are older. Always use your Vitamin A at night. Contrary to popular belief, the reason for this is not because retinoids thin the skin or make them "photosensitive" for that matter. Let's think about this logically for a minute. A product that promotes cellular reproduction and compacts the cells of the epidermis makes the skin more sensitive to sunlight? No, absolutely not. As I stated before, retinoids thicken the skin. They must be applied at night because retinoic acid degrades in sunlight. Essentially, it is unstable when exposed to artificial light and sunlight, and thus, must be applied right before bed. Apply retinol to face, neck and chest (pm only). Like anything else, there are rules of engagement. You want to maintain radiant, youthful skin. You want to prevent aging. You want to reverse fine lines and wrinkles. You want to correct pigmentation. You have large, clogged pores. You are prone to acne. You care about the long-term health of your skin. You have an exfoliating treatment scheduled within the next seven days. You are bad at wearing sunscreen. Retinoids are derivatives of Vitamin A. The body converts them to its bioavailable form, retinoic acid. Retinoids come in prescription or over-the-counter form. My recommendation is Madhippie Vitamin A.
Retinoic Acid binds to receptors and instructs them to behave like youthful cells. Here's to happy, healthy skin! If you have any unanswered questions please comment below!